The majestic, black silhouettes of deeply-rooted palm trees line the Los Angeles sky, as a the pinks and oranges of sunset spill out around them. The buildings of Downtown stretch into the purpling sky, the sun still sparkling off their rooftops. I walk alone. As the sun fades and the world begins to settle into darkness I become increasingly aware of my surroundings. I round the corner of Fifth and Broadway, clutching my purse a little closer. I walk with my face down until a voice in my head brings an abrupt halt to my hastening pace. Why am I afraid? I look up. I see a mother with heavy eyes shuffling her three young children onto the city bus, an impatient line forming behind her. I hear the tipsy laughter of friends as they stumble through a door, passing a chalkboard that reads “Happy Hour.” I smell freshly chopped limes, onions, and cilantro as they sit patiently on the edge of a food truck, just waiting to smoother the simmering carne asada inside. Every person is moving through this city with their own purpose, unaware of each other. I am humbled. This place may deserve my awareness, but it has done nothing to deserve my fear. Downtown Los Angeles is currently undergoing a series of construction projects that, combined, is the largest Downtown Los Angeles renovation since the 1920’s (L.A. Times). Collectively the projects have become known as the “Revitalization of Downtown.” While the city is getting a facelift and growing simultaneously, the true culture of downtown can already be found on the streets. One example of this is the monthly art walk put on by the nonprofit organization, Downtown Art Walk, who aim to “support local community economic development.” On the second Thursday of every month along Spring St and Main St between 2nd and 9th street young budding artists can be found peddling their latest projects, the air fills with tantalizing smells flowing from street vendors, and small businesses open their doors extra late in hopes of drawing in new clientele (Downtown Art Walk). People from all around the greater Los Angeles area come to share their work or discover the work of others. Food is a vital component to many cultures around the globe. Grand Central Market has become a catch-all for individuals to showcase cuisine from their heritage. Mouth watering pupusas are nestled in with guilt-free vegan ramen next to authentic fresh made pastas beside huge and well-rated tacos. All of these flavors and aromas come together to offer a delightfully diverse and unique dining experience. Sweet, savory? They have it all. Customers can take their taste buds around the world in one single compact city block. After shopping and eating there is still more to be done in Downtown Los Angeles. The city might not initially come across as a place to find beautiful or even interesting architecture, but once again this city center is prepared to surprise. The Bradbury Building draws both locals and visitors by its impressive wrought iron staircases that ascend into a glass ceiling. Due to the many vacant buildings around the city, incoming businesses have taken advantage of the history that comes with the pre-existing architecture. Mas Malo and The Last Book Store, for example, both inhabit old banks. They each have even repurposed many of still-standing structures from the previous tenants! The Broad Museum and the Walt Disney Concert Hall are both relatively newer construction, but still have a lot to offer aesthetically inside and out. Anyone passing on the sidewalk would be visually pleased by the sharp features of the Broad Museum. In contrast, the Walt Disney Concert Hall building seems to flow with the Santa Ana winds as the wisp through Southern California. Downtown Los Angeles has gained quite the reputation for grit and grime over the past few decades. Parts of it are even regularly compared to third-world countries by locals. To deny the immense poverty on display in DTLA would be a injustice to the community. In fact, according to a July 2017 article in the L.A. Times the homeless count in Los Angeles County was up 28%, reaching a whopping 58,000 people (unsettling, right? Find ways to help here). Many of these individuals call the sprawling city streets of Downtown their home. This statistic can be daunting and (unfortunately) the crime that is associated with homelessness can turn many away from this diamond-in-the-rough part of town. However, mixed within the crumbling facade of the city are artists, inspired young chefs, musicians and many others who are bringing new life to the city center. 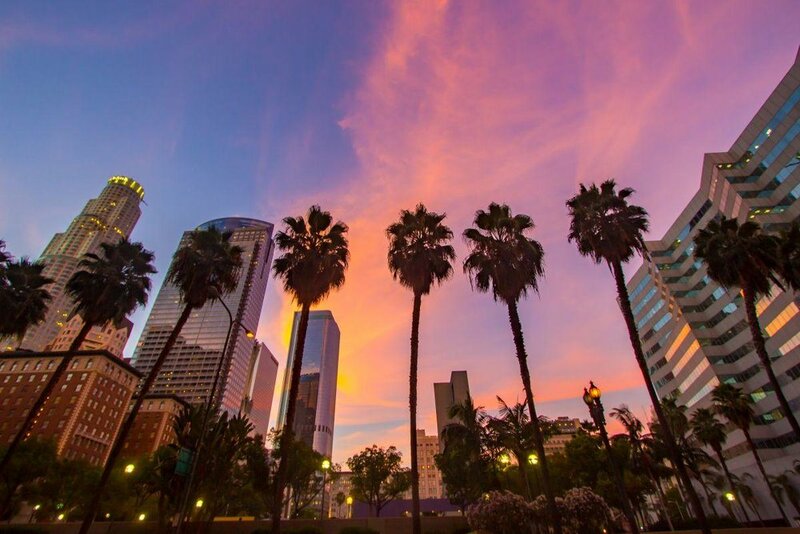 It is a new day in Downtown Los Angeles. I exit the metro at Pershing Square, confident and ready to take on the city. As I march my way up the escalator toward Fifth Street the sun shines on my face; its an oddly warm January day. A couple is cuddled in the grass beside the station. The city bus’ brakes whine in protest as it comes to a halt across the street. Big city smells fill my lungs and I set off to discover the next great glass of wine DTLA has to offer. I am comfortable. Aware, but comfortable. It is a beautiful day in my city.